Carleton Cove Resort is in it's 11th year and the following information is offered to help you get to know a little about us and hopefully you will wish to spend some time at our place on Paradise Lake. We have three units two of which are 750 square feet with two bedrooms, living area, kitchen eating area and full bathroom with a tub. They both have large screened in porches that are set up with tables and chairs that give the units over 1000 feet of living space. Our third unit is 1250 square feet with a unique set up of three bedrooms. The unit is the result of combing a two and one bedroom unit so that there is separation between what is a two-bedroom area and a separate single unit with a screened in porch connecting the two. This creates a two baths, three bedrooms, two-kitchen unit, ideal for family and parents who like a little separation. The porch adds another 300 feet giving the unit a living area in excess of 1550 feet. It even has a piano, three refrigerators, two microwaves and two TVs. There are closets and built in dressers in all the units so that you can really move in and not live out of a suitcase. Along with the bedrooms, each unit has at least one fold out sofa sleeper. You have your own hot water tank and in-wall heater for those occasional cool mornings. We have never experienced the need for air conditioning; our trees and water do a great job of cooling us at night. Our well water is some of the best you'll ever drink. No iron taste or smell from cool artesian wells. We recently tested the water for all forms of chemicals and found no problems. That info is posted in the units. Zero lead and no chlorine. 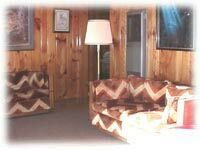 Our décor is knotty pine within and colored aluminum siding and cedar shake outside with good size windows and plenty of relaxing furniture to kick back on. Not to get totally away from civilization, each unit has a color TV equipped with cable. Bring a VCR if your inclined, the local General Store has videos for rent. There are no phones in the units but there is one available for messages and needed calls at the office. A FAX is also available but you are here to get away, aren't you? 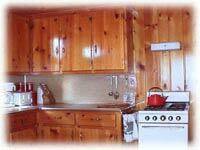 All units are completely equipped with bedding, cooking utensils and service for 8 or more. Microwave, toasters, pots, pans, and a coffee pot plus a good size refrigerator and stove, every thing you need is here. All you need are towels and food. Gas barbeques and picnic tables come with each unit but we all share the fire pit. Each unit has a direct view of the lake and the farthest unit is 75 feet from the water. Our entire site is some 8 acres and our private waterfront is about 200 feet long. We aren't wilderness but have plenty of space and nobody seems crowded or cramped. Access to the resort from the main blacktop is via a dead end dirt road that generally keeps thru traffic to a minimum. Nice for a walk or bike ride. We may not have many deer or bear running through the resort, but we can show you were to go near by to see them along with Elk and other wildlife. Bird watching is a favorite pastime and we have some excellent areas to see Osprey, Eagles, Herons and many other species right on Paradise Lake. We even have Archilochus Colubris, better known as the Ruby Throated Humming birds flirting around. We do have nesting Loons on the lake along with at least two pair of American Bald Eagles with active nests. We have a central fire pit in the green area plus firewood. We have horseshoes, bocce and generally a lot of playing or sunning room. We have lounge chairs, a hammock and plenty of trees if you don't want the sun. We share our toys amongst all our visitors. 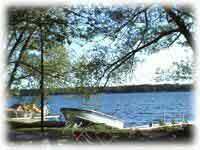 You will find a large open green area on the lakeside of the cottages with a combination grass and sand beach that lead to the sand and gravel bottom lake. Swimming on the site is great with a very gentle slope and no drop off. The water is warm too, even in June. Haven't noted any swimmers itch. We have a couple of docks at which we have a couple of newer 16-foot boats for your free use. We even have a canoe and paddled boat. We don't have motors but you can bring your own. If you have your own boat, there is a free DNR launch ramp just across the lake from us and we have plenty of dock space for all. The lake is an excellent fishing lake for Northern and Bass. Walleye and Perch are also taken along with plenty of pan fish. The lake is also a great recreational lake with skiing and jet skis. The lake is almost 2000 acres so there is plenty of room for all. Carleton Cove has actually been in existence since 1960 but had been used mainly by the McCormick Foundation as a lodging place for it's professors that taught at the Headlands in Mackinaw City. The units, of which there are only three, were only lightly used and because of that they are in excellent condition. We are 15 minutes from beautiful sand duned beaches on Lake Michigan or the more rocky Lake Huron. 10 minutes from Mackinaw City. 20 minutes from Wilderness State Park. Mackinac Island Ferries, Fort Michilimackinac, Mill Creek and some beautiful wildlife preserves are all within 15 minutes. Some what farther but still within a hour or so is Sault Saint Marie with its locks, Tahquamenon Falls, Drummond Island, Petoskey, Cheboygan and Indian River. Gambling is as close as St. Ignace, Petoskey, Brimley or the Soo. Large shops and food centers like, Glens or Carters, are found in Petoskey and Cheboygan. Closer, albeit smaller, an IGA is located in Mackinaw City and a good old "General Store" is less than a mile from the Resort. The latter two have all the necessary items and good selection of meats and fresh veggies. You can walk to the general store. Shopping is fun with a wide range of shops from antiques to modem art. From Petoskey's Gaslight district through Mackinaw City's "Crossings" to Mackinac Island, shops offer a wide range of products and gifts. We even have a Wal-Mart and K-Mart in Cheboygan or Petoskey and a movie theater and stage house in Mackinaw City. Bait, Tackle, Motor Rentals and Fishing Licenses are also available less than a mile away. Burger King and KFC are found in Mackinaw City along with a wide range of local eateries that range from family dining to casual elegant four star dining. Goldie's Cafe On The Lake offers home-style cooking just across the lake from us. Leggs Inn in Cross Village has great Polish food and an outdoor setting overlooking Lake Michigan. A great place for sunsets. 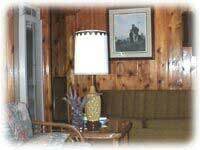 The Hack-Ma-Tack Inn & Restaurant is fine dining in an old log cabin lodge on the Cheboygan River just outside Cheboygan. There are adventure golf and championship courses within 30 minutes. Local entertainment and laid-back watering holes are close and varied. Musical interests range from dancing to the sound of the local bands to concerts on the waterfront in Mackinaw City .Car shows other events have there weekends in Mackinaw City. Bicycle racers to bridge walkers get there chance to cross the mighty Mac. Medical facilities and ambulance service is available in the area. Petoskey's Northern Michigan Hospital, or the Cheboygan Medical Center, are fully staffed hospitals and excellent treatment centers for any range of problems. We have a county wide 911 services and a responsive ambulance service. We generally do not have to lock our doors or put away the toys and our local Sheriffs Patrol is excellent for keeping the peace throughout the region.